Supervision of fieldworkers means making sure that they are following the procedures and techniques in which they were trained, Supervision involves quality control and editing. sampling control. control of cheating. and central office control. Quality control of fieldworkers requires checking to see if the field procedures are being properly implemented.” If any problems are detected, the supervisor should discuss them with the fieldworkers and provide additional training if necessary. To understand the interviewers’ problems. the supervisors should also do some interviewing. Supervisors should collect questionnaires and other forms and edit them daily. They should’ examine the questionnaires to make sure all appropriate questions have been completed, unsatisfactory or incomplete answers have not been accepted, and the writing is legible. Supervisors should also keep a record of hours worked and expenses. This will allow a determination of the cost per completed interview, whether the job is moving on schedule, and if any interviewers are having problems. An important aspect of supervision is sampling control, which attempts to ensure that the interviewers are strictly following the sampling plan rather than selecting sampling units based on convenience or accessibility. Interviewers tend to avoid dwellings or sampling units that they Perceive as difficult or undesirable. If the sampling unit is not at home, the interviewers may be tempted to substitute the next available unit rather than call back. Interviewers sometimes stretch the requirements of quota samples. For example, a 58-year-old person may be placed in the 46- to-55 age category and interviewed to fulfill quota requirements. To control these problems, supervisors should keep daily records of the number of calls made, number of not-at-homes, number of refusals, number of completed interviews for each interviewer, and the total for all interviewers under their control. Cheating involves falsifying part of a question or the entire questionnaire. An interviewer may falsify part of an answer to make it acceptable or may fake answers. The most blatant form of cheating occurs when the interviewer falsifies the entire questionnaire, merely filling in fake answers without contacting the respondent. Cheating can be minimized through proper training, supervision, and validation of fieldwork. Supervisors provide quality and cost-control information to the central office so that a total progress report can be maintained. In addition to the controls initiated in the field, other controls may be added at the central office to identify potential problems. Central office control includes tabulation of quota variables, important demographic characteristics, and answers to key variables. Validation of fieldwork means verifying that the fieldworkers are submitting authentic interviews. To validate the study, the supervisors call 10 to 25 percent of the respondents to inquire whether the fieldworkers actually conducted the interviews. The supervisors ask about the length and quality of the interview, reaction to the interviewer, and basic demographic data. The demographic information is cross-checked against the information reported by the interviewers on the questionnaires. It is important to evaluate fieldworkers to provide them with feedback on their performance as well as to identify the better fieldworkers and build a better, high-quality field force. The evaluation criteria should be clearly communicated to the fieldworkers during their training, The evaluation of fieldworkers should be based on the criteria of cost and time, response (2(es, quality of interviewing, and quality of data. The interviewers can be compared in terms of the total cost (salary and expenses) per completed interview. If the costs differ by city size, comparisons should be made only among fieldworkers working in comparable cities. The fieldworkers should also be evaluated on how they spend their time. Time should be broken down into categories such as actual interviewing, travel, and administration. It is important to monitor response rates on a timely basis so that corrective action can be taken if these rates are too low Supervisors can help interviewers with an inordinate number of refusals by listening to the introductions they use and providing immediate feedback. When all the interviews are over, different fieldworkers percentage of refusals can be compared to identify the better ones. To evaluate interviewers on the quality of interviewing, the supervisor must directly observe the interviewing process. The supervisor can do this in person, or the fieldworker can tape record the interview. 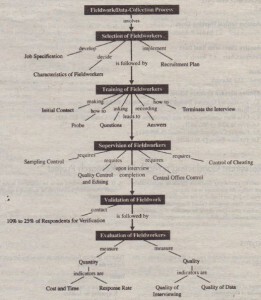 The quality of interviewing should be evaluated in terms of (1) the appropriateness of the introduction, (2) the precision with which the fieldworker asks questions, (3) the ability to probe in an unbiased manner, (4) the ability to ask sensitive questions, (5, interpersonal skills displayed during the interview, and (6) the manner in which the interview is terminated. The completed questionnaires of each interviewer should be evaluated for the quality of data. Some indicators of quality data are (1) the recorded data are legible; (2) all instructions, including skip patterns, are followed; (3) the answers to unstructured questions are recorded verbatim; (4) the answers to unstructured questions are meaningful and complete enough to be coded; and (5) item non-response occurs infrequently. 2. Read each question exactly as written. Report any problems 10 the supervisor as soon as possible. 3. Read the questions in the order indicated on the questionnaire, following the proper skip sequences . 4. Clarify any question by the respondent in a neutral way. 5. Do not mislead respondents as to the length of the interview. 6. Do not reveal the identity of the ultimate client unless instructed to do so. 7. Keep a tally on each terminated interview and the reason for each termination. 8. Remain neutral in interviewing. Do not indicate agreement or disagreement with the respondent. 9. Speak slowly and distinctly so that words will be understood. 10. Record all replies verbatim, not paraphrased. 11. Avoid unnecessary conversations with the respondent. 12. Probe and clarify for additional comments on all open-end questions. unless otherwise instructed. Probe and clarify in a neutral way. 13. Write neatly and legibly. 14. Check all work for thoroughness before turning in to the supervisor. 16. Keep all studies. materials. and findings confidential. 17. Do not falsify any interviews or any answers to any question. 18. Thank the respondent for participating in the study. What’s it like to shop for casual clothing? Design a questionnaire to determine students’ shopping behavior for casual clothing-the kind they wear to school. Administer the survey to five different students on your campus. 1. How did you feel approaching these respondents? 2. What seemed to be the most challenging part of the survey for the respondents? 3. If other students were employed to collect the data for this survey project. how should they be trained? 4. If ether students were employed to collect the data for this survey project. how should the fieldwork be supervised? 5. If other students were employed to collect the data for this survey project. how should the fieldwork be evaluated? In the department store project, in-home personal interviews were conducted by interviewers who were graduate a undergraduate students enrolled in marketing research courses taught by the author. The fieldworkers’ training included having each interviewer (1) act as a respondent and self-administer the questionnaire and (2) administer the questionnaire to a few other students not involved in the project (dummy respondents). 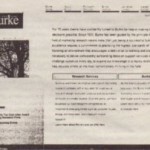 Detailed guidelines for interviewing were developed and provided to each interviewer. The supervision of interviewers was carried out by graduate students who monitored the fieldwork activities on a day-to-day basis. All the respondents were called back to verify that the interviewer had actually administered the questionnaire to them and to thank them for participating in the survey. A 100 percent validation check was performed. All the fieldworkers, interviewers. and supervisors were evaluated by the author. 1. Discuss the training and supervision of fieldworkers in the sears project. 2. If an Internet-based survey was administered. instead of personal in-home interviews. how would the fieldwork change? The selection. training. supervision, and evaluation of fieldworkers are critical in international marketing research. Local fieldwork agencies are unavailable in many countries. Therefore it may be necessary to recruit and train local fieldworkers or import trained foreign workers, These of local field workers is desirable, because they are familiar with the local language and culture. They can thus create an appropriate climate for the interview and be sensitive to the concerns of the respondents. Extensive training may’ be required and close supervision may be necessary. As observed in many countries. interviewers tend to help the respondent with the answers and select household or sampling units based on personal considerations rather than the sampling plan. Finally. interviewer cheating may be more of a problem in many foreign countries than in the United States. Validation of fieldwork is critical. Proper application of fieldwork procedures can greatly reduce these ~difficulties and result in consistent and useful findings. International marketing research studies add more complexity regardless of how simple a survey may seem. Collecting data that is comparable between countries may be difficult. but it can be done using some standard methodologies with adaptations when needed, Equivalent marketing research procedures allow researchers to detect, analyze. and better understand the world’s socio cultural differences. A global approach to marketing research is desired, which may require changing several methodologies for studies conducted in the United States so that U.S. data can be compared to other countries. An image study conducted by Research International market research company, showed that despite unification of the European market, European consumers still increasingly favor U.S. products. It i, expected that Americanism will unite consumers in Europe. The survey was conducted in France, Germany, the United Kingdom, Italy, and the Netherlands. In each country. local interviewers and supervisors were used. because it was felt they would be able to relate to and identify better with the respondents. However. the field workers were trained extensively and supervised closely in order to ensure quality results and minimize the variability in country-to-country result, due to differences in interviewing procedures. This study is very use for marketers to drum up and overplay the American brand name in the European market. “Rather than trying to hide the fact that they are American, we think companies ought to stress or try to exploit their American heritage,” says Mr. Eric Salama, director of European operations for the Henley Center, the U.K. economic forecasting consultancy. U.S. firms have, in fact, capitalized on the “made in America” equity. As a result, exports to Europe have been soaring in recent years. As of 2008, California leads the nation in being the top state in terms of exports to the European Union. The data, whether collected by the internal marketing research department or by an external fieldwork agency, should be obtained by following high ethical standards. 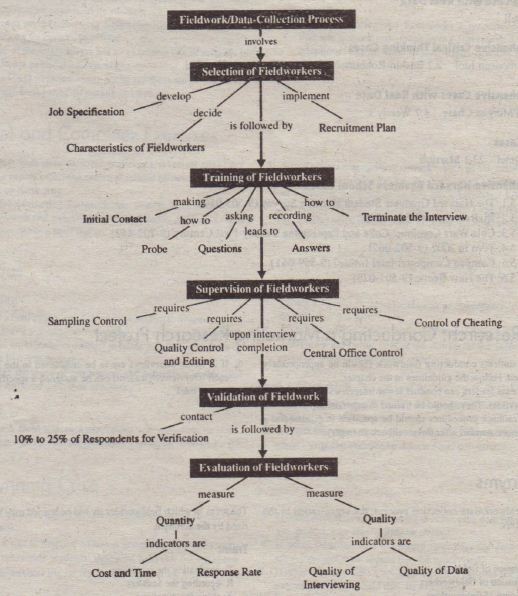 The researchers and fieldworkers should make the respondents feel comfortable by addressing their apprehensions: One way in which the comfort level of the respondents can be increased is by providing them with adequate information about the research firm and the project, addressing their questions, and clearly stating the responsibilities and expectations of the fieldworkers and the respondents at the start of the interview. Moreover, the respondents should be told that they are not obligated to answer questions that make them uncomfortable, and that they can terminate the interview at any point should they experience discomfort. The researcher and fieldworkers have an ethical responsibility to respect the respondents’ privacy, feelings, and dignity.21 Moreover..the respondents should be left with a positive and pleasant experience. This will enhance goodwill and future cooperation from respondents. The researchers and the fieldwork agencies are also responsible to the clients for following he accepted procedures for the selection, training, supervision, validation, and evaluation of fieldworkers, They must ensure the integrity of the data-collection process, The fieldwork procedures should be carefully documented and made available to the clients. Appropriate actions by researchers and fieldwork agencies can go a long way in addressing ethical concerns associated with fieldwork. Information provided while responding to an 800 number, using a credit card, or purchasing a product is often used to compile lists of customers and potential customers. These lists are rarely sold to telemarketing and direct marketing organizations. The public perception is different, however, and many people feel that marketers and marketing researchers misuse the information they collect. This mis-perception is giving marketing research a negative image. In an effort to-fight back, many marketing researchers and fieldwork agencies are addressing this issue head-on at the start of the interview. For example, when contacting potential respondents, the (www.themarketingresearch.com) provides them with information about the firm (Gallup) and the marketing research project, The respondents are assured that Gallup operates within a code of ethics. Some marketing research firms and fieldwork agencies provide potential respondents with toll-free numbers and Web site addresses to obtain more information or verify the information given by the fieldworkers, Such actions make the respondents more comfortable and informed, and result in higher quality data for the clients. Carlos Ghosn, president of Nissan Motor Co., was brought in to revive the financially troubled company shortly after the French automaker, Renault, acquired a controlling interest in Nissan. Ghosn is not afraid to take different paths and knows that taking risks to meet consumer demand is what business is all about. Ghosn orchestrated 8 product revival at Nissan that included a return of the iconic Z sports car and entries in new segments such as the Murano crossover SUY and Titan full-size truck. At the same time under his Nissan Revival Plan, he cut costs, reduced debt, improved efficiency, and returned the company to profitability. Nissan wants to continue its efforts to enhance the effectiveness of its marketing well into 2015. As part of that, Nissan would like to conduct mall-intercept interviews with consumers to determine the type of positioning for the Z sports car, particularly 350Z, which will appeal to the younger buyers, The questionnaire is a mix of unstructured and structured questions, Some of the questions require substantial probing of the respondents, and the supervision of the interviewers will be critical to collecting good-quality data. 1. In what areas should the supervisors be trained to closely monitor the interviewers? 2. Discuss the role of the supervisor training you recommend in enabling Carlos Ghosn to identify the needs of the younger sports car buyers. 1. Carlos Ghosn wants to enhance the appeal of the Z sports cars to the younger buyers. What changes should be made? 2. Discuss how the marketing management decision action that you recommend Carlos Ghosn is influenced by the supervisor training that you suggested earlier and by the fir.dings of mall-intercept interviews. Given his success at Nissan, Renault’s board of directors, at its meeting on April 29,)2005, appointed Carlos Ghosn president and CEO of Renault. Renault and Nissan have a strategic alliance that was signed on March 27, 1999, and was still in effect in 2009. SPSS offers several programs to assist in fieldwork or data collection. Moreover, a number of different methods of administering the survey can be accommodated, including telephone, electronic, mail, and personal interviewing. 1. SPSS Data Entry Station (DES): This deployment method will put a copy of the questionnaire on a computer so that a data-entry operator or respondent can enter the answers on the screen using the keyboard and mouse (without giving them the ability to edit the form). In his way. to some extent, data entry can simulate a proper CATI system because you can pre-populate the data with the phone number and basic details of the respondent so the information appears as the operator moves through the list. However, this system completely lacks the ability to keep a call log and a callback list, which most good, true CAT! systems should do. 2. SPSS Data Entry Enterprise Server (DEES): This deployment method will upload a copy of the questionnaire to a Web server so that data-entry operators or respondents can log on using password and enter their results without having to install anything on their local machine. I)l;ES can be used on both intranet and Internet settings. This software also includes; technology that prevents ballot stuffing (a respondent answering the survey multiple times). 3. Printing the form: This can be done by using SPSS Data Entry (DE) Builder to simply print the form after it has been designed for a mail surveyor personal interviewing, This is the least sophisticated method because the researcher will not be able to take advantage of space-saving pull-down menus or any of the rules that were included, The rules can be used when the follow-up data entry is done, but in many situations If there is an error, it may be too late to correct it, For a personal interview, it may be a better option for the interviewer to use a laptop with the form in DE Station, because the rules will “fire” as the questions are answered, thus allowing for quick corrections if required.